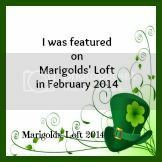 Marigolds' Loft: Featured Crafters this February. Thank you to all you lovely crafters that linked up their stuff over the past month. as well as this amazing sounding Mint Chocolate Cupcakes! Thank you so much ladies for sharing your wonderful, inspirational St. Paddy's Day crafts with us all. I look forward to seeing you all again tomorrow for the beginning of the new month's Challenge! Thanks so much for featuring my Beaded Shamrock from your St Patrick Day Challenge submissions. And a warm Thank You goes out to you, Natalie, for hosting these wonderful themed parties!